Mainbocher’s plaque on the Fashion Walk of Fame. It’s been awhile since I have done a Fashion Walk of Fame post, but I knew when I returned to this series that I wanted to highlight Mainbocher, and my reading this year of a biography of the Duchess of Windsor only made me more interested in him. Main Rousseau Bocher was born October 24, 1890 and was a native of Chicago. After studying art at the University of Chicago and the Chicago Academy of Fine Arts, he served in the Army in World War I and stayed in Paris after the war. He worked as a fine arts illustrator for Harper’s Bazaar and then as Paris fashion editor of Vogue. 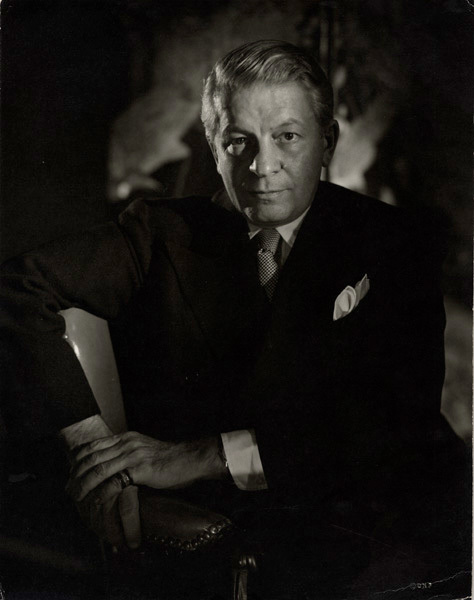 He eventually became Editor in Chief of French Vogue in 1927, which is kind of amazing when you think about it, that an EIC could end up a hugely successful fashion designer and one of the two sole Americans ever to be admitted to the Chambre syndicale de la couture parisienne (Parisian High Fashion Syndicate) (Ralph Rucci is the other). In 1929 Main Bocher fused his name together and started a fashion house called Mainbocher Couture, which continued in Paris until 1939. In 1940 he moved his business to New York City. 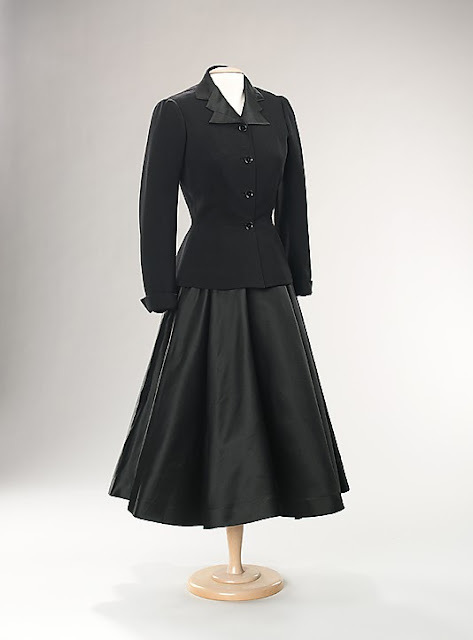 In his day he dressed women from fashion editors Carmel Snow and Diana Vreeland, to society ladies like Millicent Rogers and Daisy Fellowes, and Hollywood stars such as Mary Pickford and Claudette Colbert. He closed his house in 1971, when he was 81. Without the jacket. I want to wear this and drink champagne. Even if you think you don’t know the work of Mainbocher, you actually do, for a couple of reasons. 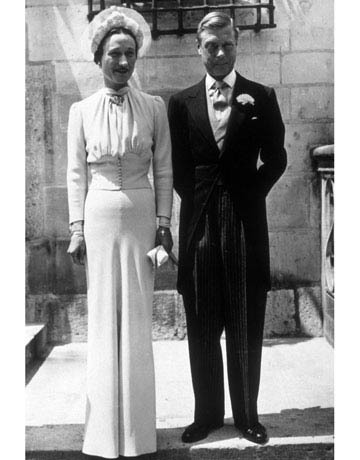 The picture below of the woman in the corset is quite famous, and you’ve probably seen a photograph of the wedding of the Duke and Duchess of Windsor on June 3, 1937. In both instances the women are wearing garments by Mainbocher. Mainbocher Corset, 1939. Photo by Horst P. Horst. The Duke and Duchess of Windsor on their wedding day. June 3, 1937. The lovely dress Mainbocher designed for Wallis to wear when marrying the former Edward VIII of England has lost its gorgeous pale shade of blue, known as Wallis Blue, due to the instability of the dye used to color the dress but it’s still quite beautiful. The Duchess of Windsor gave her Mainbocher wedding ensemble to The Metropolitan Museum of Art in 1950. 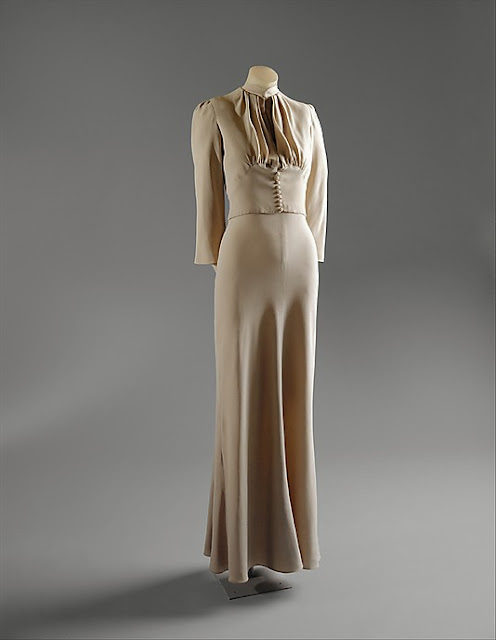 Wallis Simpson’s wedding dress, 1937. Mainbocher, 1941. 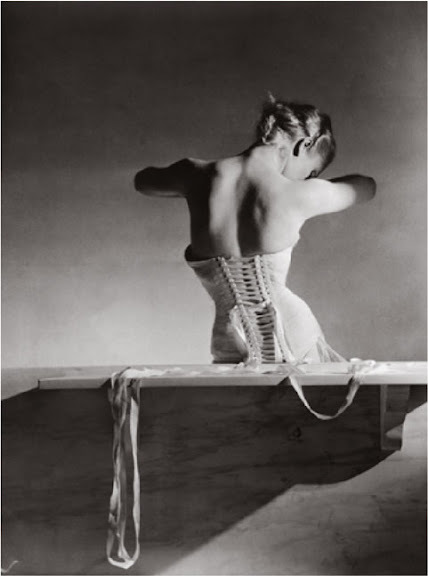 Photo by Horst P. Horst. As for the pronunciation of his name, I have read it’s said in the French way (Man-bo-shay) and also that it’s actually said “Main-Bocker.” I’ll take the French way, thank you very much, and wouldn’t he as well, since he spent so much time in Paris? Mainbocher’s plaque is on Seventh Avenue in New York City, between 37th and 38th Streets, next to milliner Lilly Daché. Pictures of the Mainbocher dresses all courtesy of The Metropolitan Museum of Art. fabulous post Jill! Your posts are always so informative and I love them all. 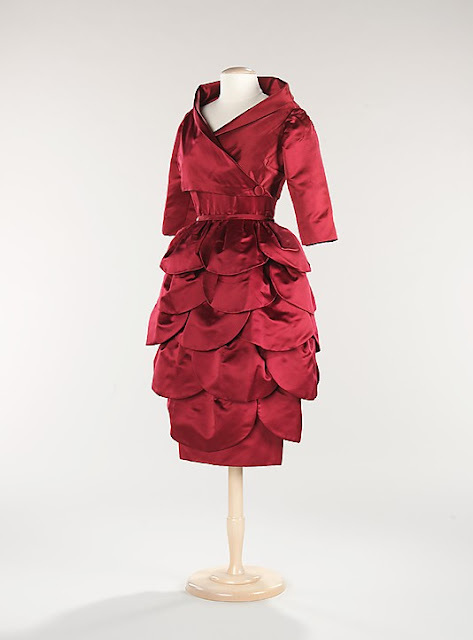 I read that the dress which Mainbocher made for Wallis wedding was listed one of the 50 most important dresses of the 20th century. I always learn something new when I visit. I have heard of Mainbocher but that was about the extent of my knowledge. Now I know who designed Wallis's wedding dress...such a gorgeous gown. The suit and Wallis' wedding dress are so beautiful! I had no idea he was behind the photo of that corset! I always learn a lot from you Jill...thanks for the lessons. I will join you in the same dress for a glass of champagne...poured over fresh peaches as Ingrid Bergman drank it in Saratoga Trunk!! Oh my goodness...I would endure all manner of corsetry to fit into that red dress. I've learned so much about him...and now think I need to read a biography of Wallis Simpson. I do love that color of blue she made so famous. Can you recommend the title of a good biography of her? How interesting! Yes, I like the French version of his name better. I love the phrase "understated elegance"....so classy! Thank you so much for all the information about Mainbocher. I love and want the red dress, ahhhhhhhhhhh. Glad to be back, my dear Jill. 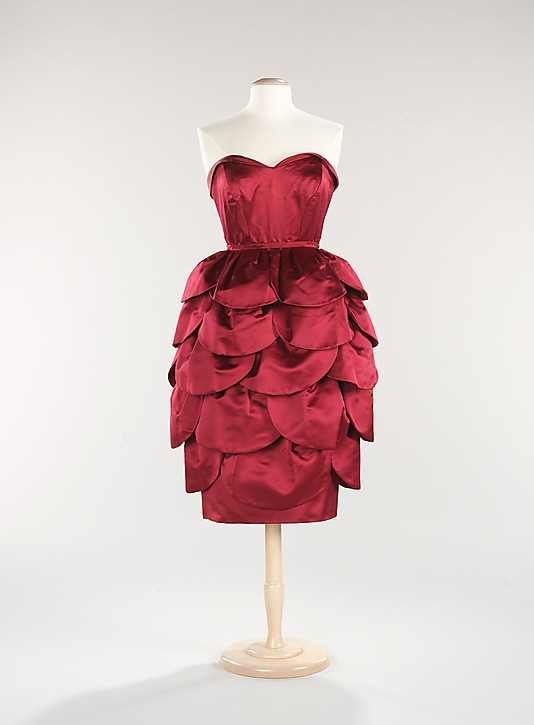 Such great fashion history info and beautiful dresses. Great post, Jill.